The media coverage of the race for president has not so much cast Barack Obama in a favorable light as it has portrayed John McCain in a substantially negative one, according to a new study of the media since the two national political conventions ended. Press treatment of Obama has been somewhat more positive than negative, but not markedly so. But coverage of McCain has been heavily unfavorable—and has become more so over time. In the six weeks following the conventions through the final debate, unfavorable stories about McCain outweighed favorable ones by a factor of more than three to one—the most unfavorable of all four candidates—according to the study by the Pew Research Center’s Project for Excellence in Journalism. For Obama during this period, just over a third of the stories were clearly positive in tone (36%), while a similar number (35%) were neutral or mixed. A smaller number (29%) were negative. For McCain, by comparison, nearly six in ten of the stories studied were decidedly negative in nature (57%), while fewer than two in ten (14%) were positive. McCain did succeed in erasing one advantage Obama enjoyed earlier in the campaign—the level of media exposure each candidate received. Since the end of August, the two rivals have been in a virtual dead heat in the amount of attention paid, and when vice presidential candidates are added to the mix the Republican ticket has the edge. This is a striking contrast to the pre-convention period, when Obama enjoyed nearly 50% more coverage. Much of the increased attention for McCain derived from actions by the senator himself, actions that, in the end, generated mostly negative assessments. In many ways, the arc of the media narrative during this phase of the 2008 general election might be best described as a drama in which John McCain has acted and Barack Obama has reacted. As for Alaska Governor Sarah Palin, her coverage had an up and down trajectory, moving from quite positive, to very negative, to more mixed. What drove that tone toward a more unfavorable light was probing her public record and her encounters with the press. Little of her trouble came from coverage of her personal traits or family issues. In the end, she also received less than half the coverage of either presidential nominee, though about triple that of her vice presidential counterpart, Joe Biden. The findings suggest that, in the end, Palin’s portrayal in the press was not the major factor hurting McCain. Her coverage, while tilting negative, was far more positive than her running mate’s. These are some of the findings of the study, which examined 2,412 campaign stories from 48 news outlets, during six critical weeks of the general election phase from the end of the conventions through the final presidential debate. Tone was examined on a subset of this sample, 857 stories from 43 outlets, those campaign stories that were focused on one of the candidates. Marion Just of Wellesley College served as a consultant on the study. The Project is funded by the Pew Charitable Trusts. Coverage of Obama began in the negative after the conventions, but the tone switched with the changing direction of the polls. The most positive stories about him were those that were most political—the ones focused on polling, the electoral map, and tactics. For McCain, coverage began positively, but turned sharply negative with McCain’s reaction to the crisis in the financial markets. As he took increasingly bolder steps to try and reverse the direction of the polls, the coverage only worsened. Attempts to turn the dialogue away from the economy through attacks on Obama’s character did hurt Obama’s media coverage, but McCain’s was even more negative. Coverage of Palin, in the end, was more negative than positive. In all, 39% of Palin stories carried a negative tone, while 28% were positive, and 33% were neutral. Contrary to what some suggested, little of the coverage was about Palin’s personal life (5%). Democratic vice presidential nominee Joe Biden was nearly the invisible man. His had just one large moment, the vice presidential debate, which also offered his only positive or neutral contribution. Aside from that week, the limited coverage he did receive was far more negative than Palin’s, and nearly as negative as McCain’s. The economy was hardly a singular lens through which the media perceived the race. Though it was the No. 1 campaign topic overall, five out of the six weeks other topics were bigger, and in the end it accounted for not much more of the campaign newshole (18%) than assessments of the candidates in the four debates (17%). Horse race reporting, once again, made up the majority of coverage, but less so than earlier in the contest or than in previous elections. Since the conventions ended, 53% of the newshole studied has focused on political matters, particularly tactics, strategy and polling. That is more than twice as much as the coverage focused on policy (20%). This focus on tactics and horse race grew in the last three weeks as both campaigns became more negative in their rhetoric. Tone is an elusive and yet unavoidable question when examining the role of the news media. Who got better coverage, and why? To examine tone, the Project takes a particularly cautious and conservative approach. Unlike some researchers, we examine not just whether assertions in stories are positive or negative, but also whether they are inherently neutral. This, we believe, provides a much clearer and fairer sense of the tone of coverage than ignoring those balanced or mixed evaluations. Second, we do not simply tally up all the evaluative assertions in stories and compile them into a single pile to measure. Journalists and audiences think about press coverage in stories or segments. They ask themselves, is this story positive or negative or neutral? Hence the Project measures coverage by story, and for a story to be deemed as having a negative or positive tone, it must be clearly so, not a close call: for example, the negative assertions in a story must outweigh positive assertions by a margin of at least 1.5 to 1 for that story to be deemed negative. One question likely to be posed is whether these findings provide evidence that the news media are pro-Obama. Is there some element in these numbers that reflects a rooting by journalists for Obama and against McCain, unconscious or otherwise? The data do not provide conclusive answers. They do offer a strong suggestion that winning in politics begat winning coverage, thanks in part to the relentless tendency of the press to frame its coverage of national elections as running narratives about the relative position of the candidates in the polls and internal tactical maneuvering to alter those positions. 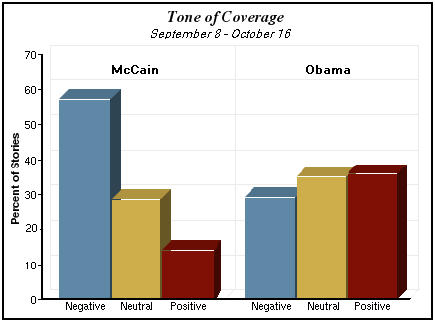 Obama’s coverage was negative in tone when he was dropping in the polls, and became positive when he began to rise, and it was just so for McCain as well. Nor are these numbers different than what we have seen before. Obama’s numbers are similar to what we saw for John Kerry four years ago as he began rising in the polls, and McCain’s numbers are almost identical to what we saw eight years ago for Democrat Al Gore. What the findings also reveal is the reinforcing—rather than press-generated—effects of media. We see a repeating pattern here in which the press first offers a stenographic account of candidate rhetoric and behavior, while also on the watch for misstatements and gaffes. Then, in a secondary reaction, it measures the political impact of what it has reported. This is magnified in particular during presidential races by the prevalence of polling and especially daily tracking. While this echo effect exists in all press coverage, it is far more intense in presidential elections, with the explosion of daily tracking polls, state polls, poll aggregation sites and the 24-hour cable debate over their implications. Even coverage of the candidate’s policy positions and rhetoric, our reading of these stories suggest, was tied to horse race and took on its cast.